To many people, the City of Wilton Manors is a hidden treasure itself. It certainly is a fascinating place to live. It is chock full of interesting people, large personalities, and entertaining things to do. The City has things for people of all ages to do. One of them is a peculiar hobby of treasure hunting. There are places you can go online to find hints toward the location of this treasure in order for you to go somewhere you may not have been before, experience the excitement of being on a hunt, and creating new memories in a creative way. I'm calling it treasure hunting, but the more accepted term is "Geocaching". With cheap GPS units being commonplace, people have placed caches of things for people to find in random places throughout the world. As one of my favourite sayings goes, all those who wander are not lost, and the excitement is in the journey not the destination. The caches can contain something simple like a piece of paper that you can write your name and date on, others have little toys or goodies in them and you can take one if you wish and are expected to replace one. The sites I have seen for these have descriptions of where to go, what to look for, and what to look out for. 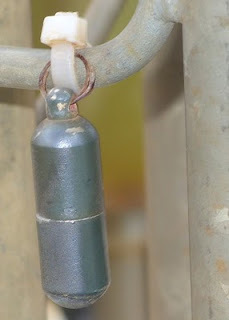 Some of the caches are described so clearly that all you have to do is locate a specific spot on your GPS and look down. Others are encrypted in a cypher hidden in an enigma within a riddle. This particular cache is the size of the vitamin pill I took this morning with my coffee. Inside is a small slip of paper of visitors. It is well known within the maintenance staff for the City and is watched over with care and a smile. It does bring visitors, as I have opened the cache and read the log. I replaced it all with care, and it is there at the moment of this writing. The comments that people have written on the sites about this particular cache speak of the treatment of the visitors to this city by the City workers, and by the folks who stay here. Its seen as a warm place, people look forward to coming back, so I see this as a positive thing for us. We have approximately six caches in the city. This one is in an accessible place and welcomes many to later visit our other attractions and perhaps learn some about our history and get to know us. The stories are amusing and sometimes heartwarming that describe the hunt. I'm purposely being vague about it. Its a harmless little thing, and a great weekend hobby for children to learn about map reading, GPS usage, Latitude and Longitude plotting and gives them a bit of practice using their minds to puzzle out the clues. Come to Wilton Manors, home of the teeny little Geocache, visit our parks and shops, and bring home memories. Ok, I'll stop being tour guide for now. If you want to play hide and seek for yourself, the only hint for that I will give you is the site that I found it on is at this link.